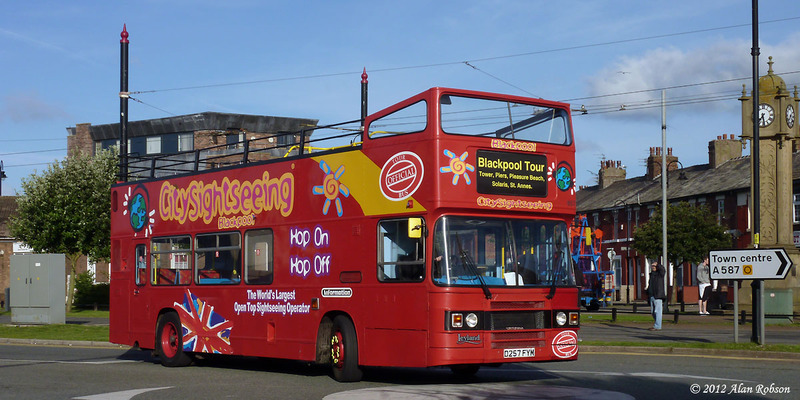 Thursday 30th August marked the end of the daytime Heritage Tour operation for this year. Fittingly Bolton 66, which was built by the Electric Railway and Tramway Carriage Company at Preston in 1901, was selected to inaugurate the service for the day, being the oldest operational tram in Blackpool. 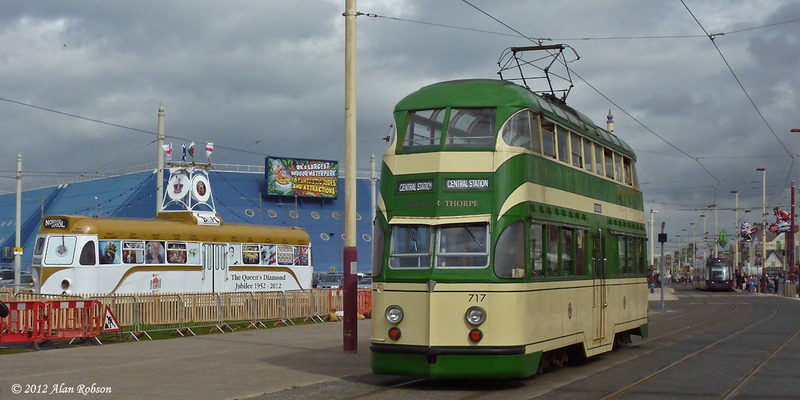 Balloon 717 was the other tram that brought the daytime heritage service to an end. 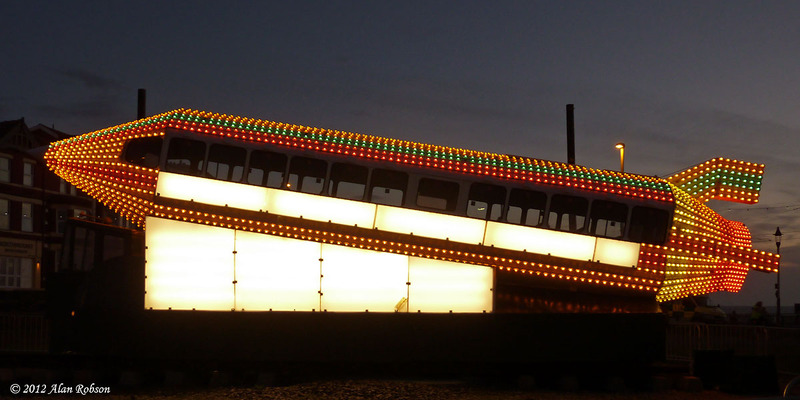 From 1st September to 4th November, Tours of the Illuminations will operate during the evenings from the Pleasure Beach only (ie the intermediate stops will not be used for picking up). 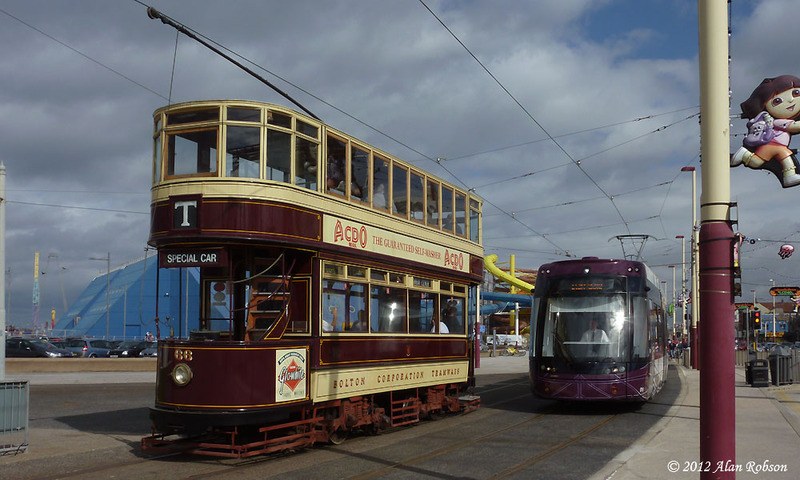 Evening heritage trams were originally due to begin operating on 31st August starting at 17:00, this service would replace the daytime Heritage Tour. 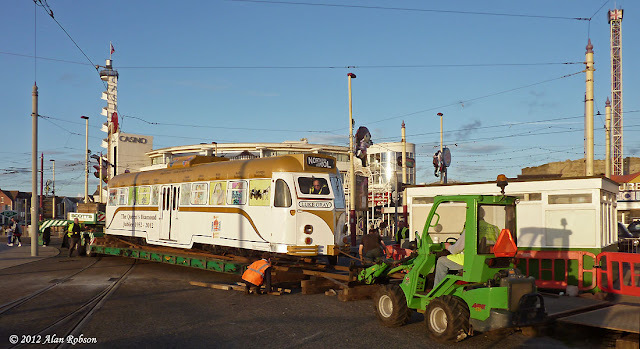 Whether the evening heritage service transpires or not is probably down to staff availability, only time will tell. 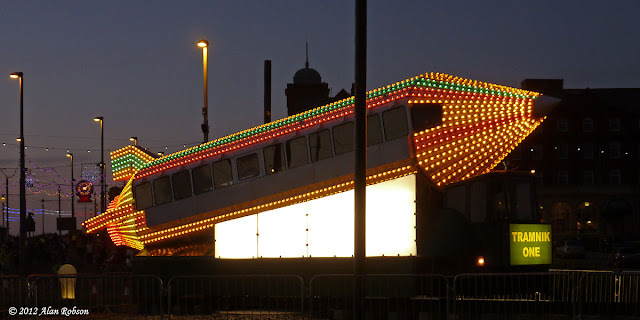 Today was the annual Ride the Lights event, whereby the promenade is closed to all road traffic for the evening, and cyclists are allowed to ride through a preview of the illuminations before the actual switch on date. 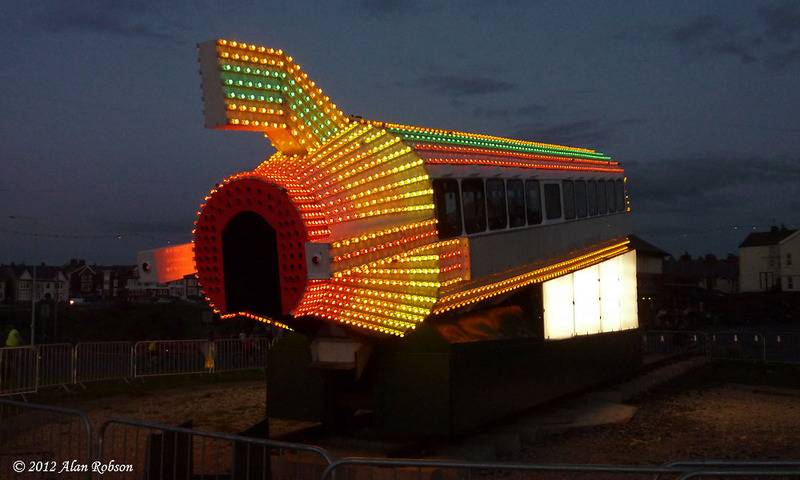 The opportunity was taken to capture some photos of the Rocket lit up on Gynn Square roundabout just after sunset. 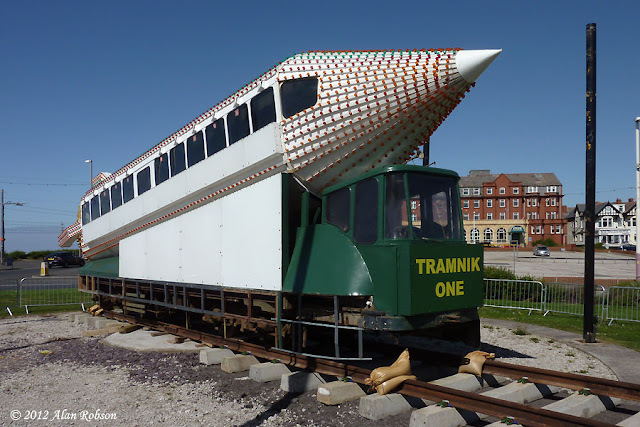 The Rocket looking as if it's all set for lift-off to the Moon! 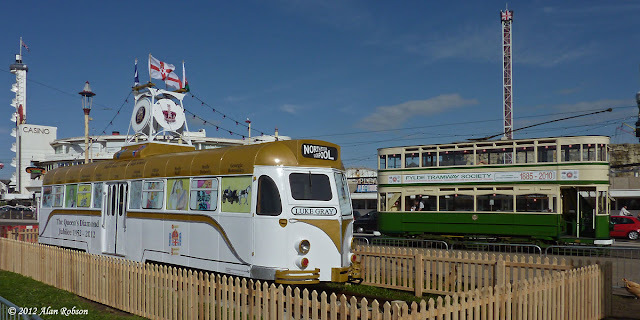 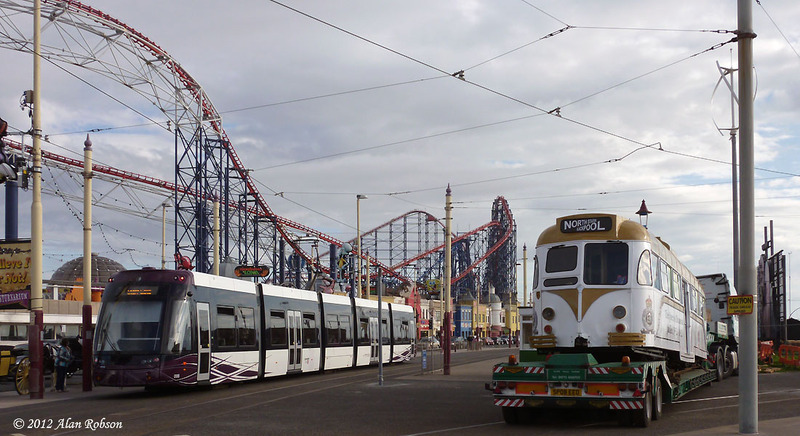 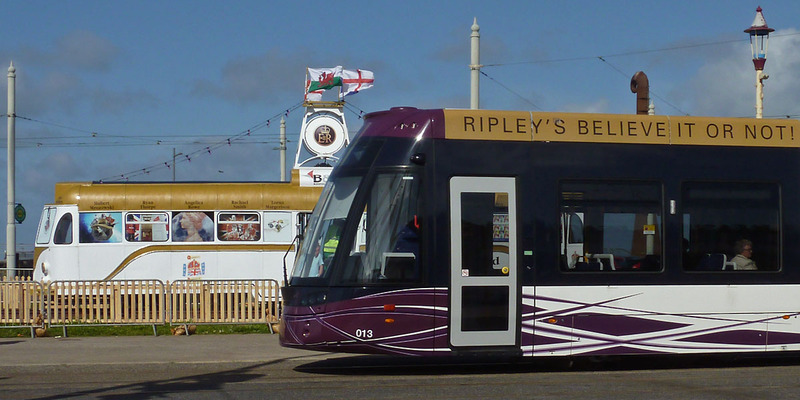 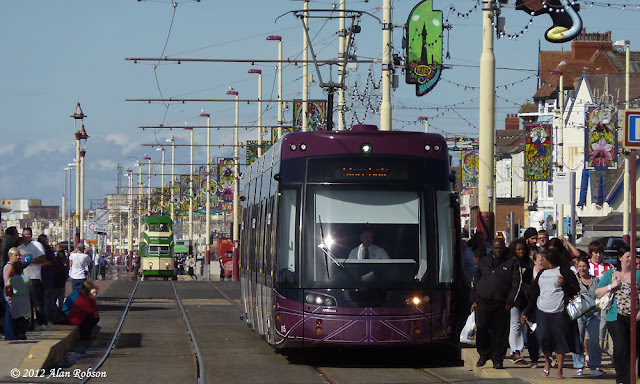 Blackpool Flexity 2 number 013 passes Brush car 627 on display at the Pleasure Beach, showing the difference in end profiles between the 1937 built Railcoach and the brand new Bombardier tram. Heritage Balloon 717 and Standard 147 were in use on the heritage service today. 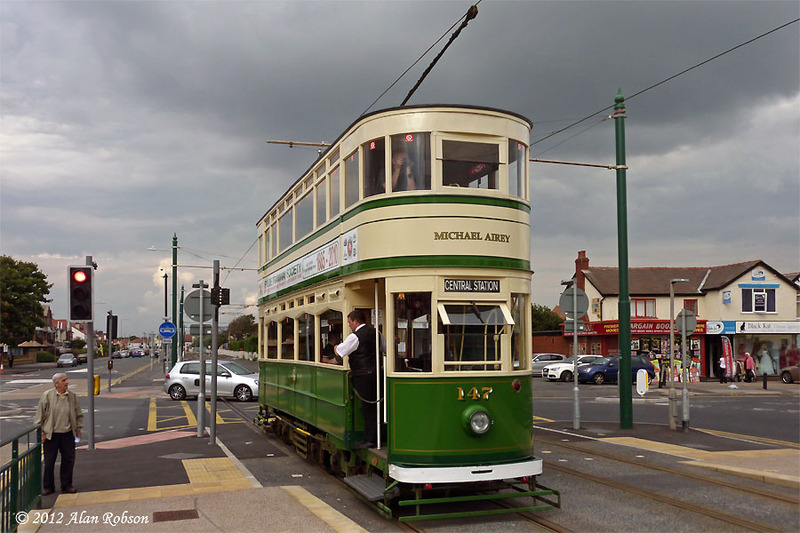 The afternoon was nice enough to warrant open top trams, but unfortunately the morning started out with heavy cloud and showers. 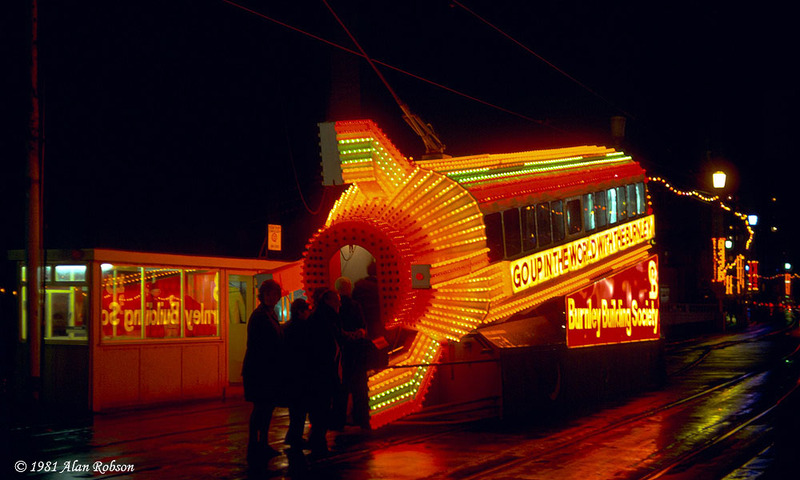 Brush car 627 has been fitted with four strings of coloured lights above the roof in addition to the existing lighting that is fitted all along the beading on the ends and sides of the tram. This afternoon the timetabled 14:55 Heritage Tour run from the Pleasure Beach was extended through to Cleveleys, where a large contingent of the passengers disembarked. The tram that was selected for this unusual working was Standard 147, which then continued on to Thornton Gate before reversing and heading south. 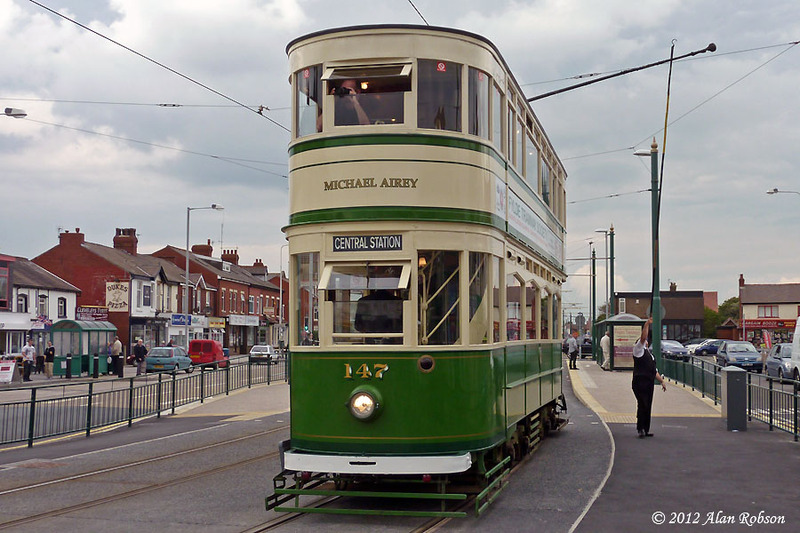 The trip was not incident free, as on the return journey through Cleveleys the trolley pole decided to dewire just south of the tram station platform. 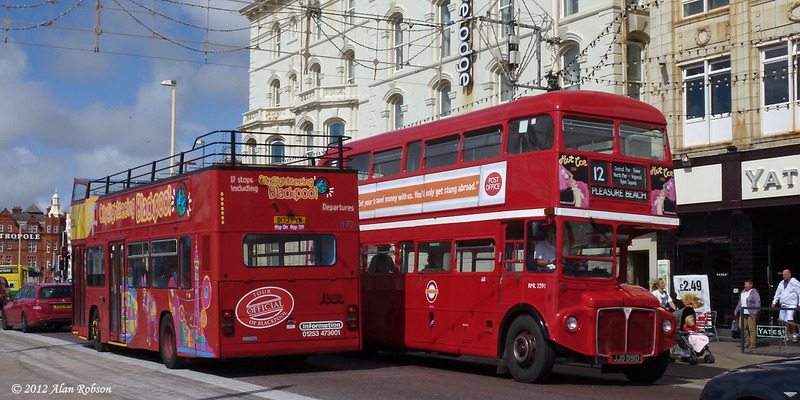 Standard 147 continues north to Thornton Gate, narrowly missing a motorist who ignored the red traffic lights! 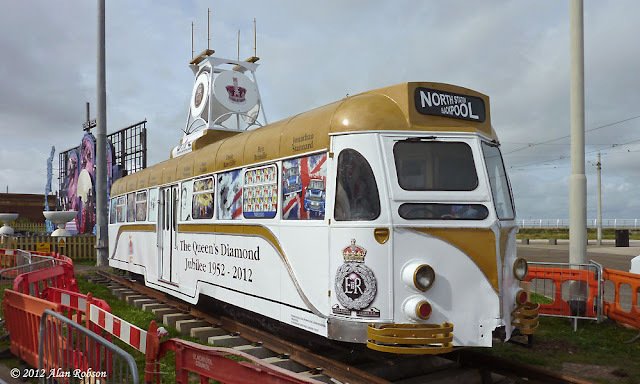 The wooden picket fence is now in place around Jubilee car 627 at the Pleasure Beach, the missing towing bracket box has been replaced and four flags are now flying from the top of the trolley tower. 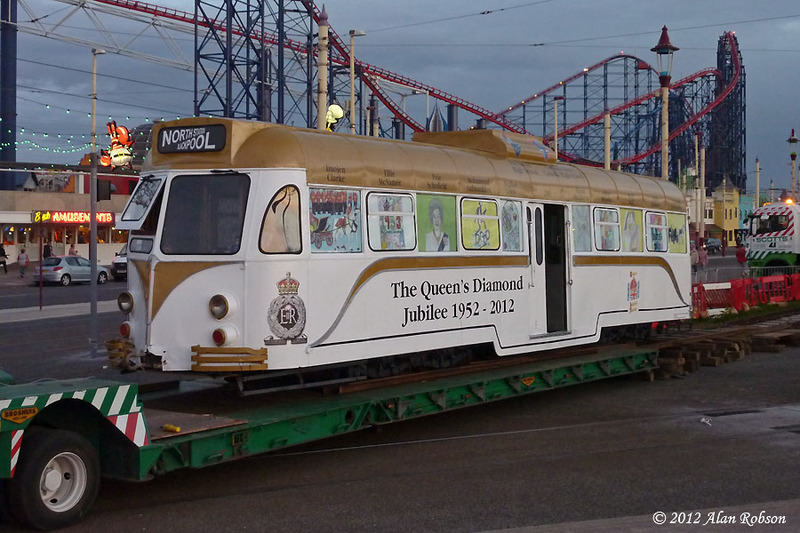 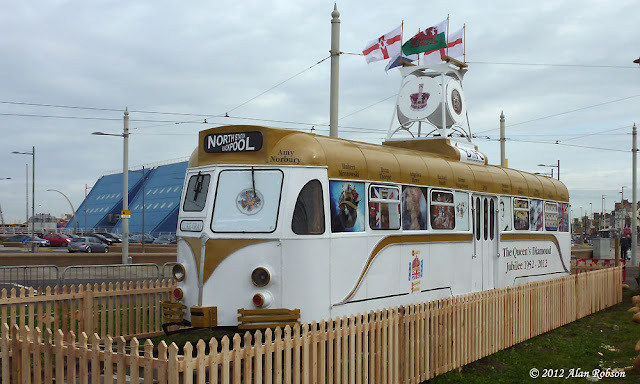 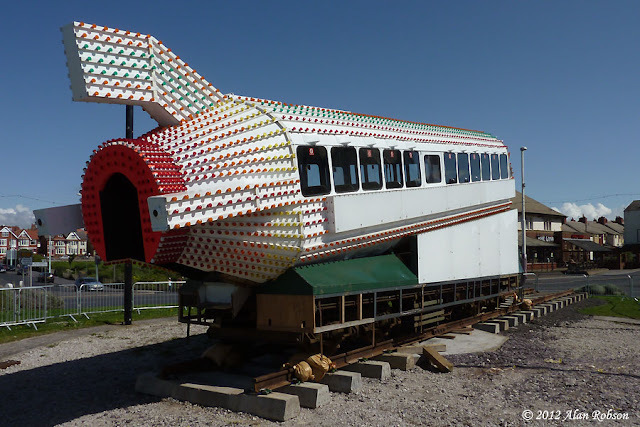 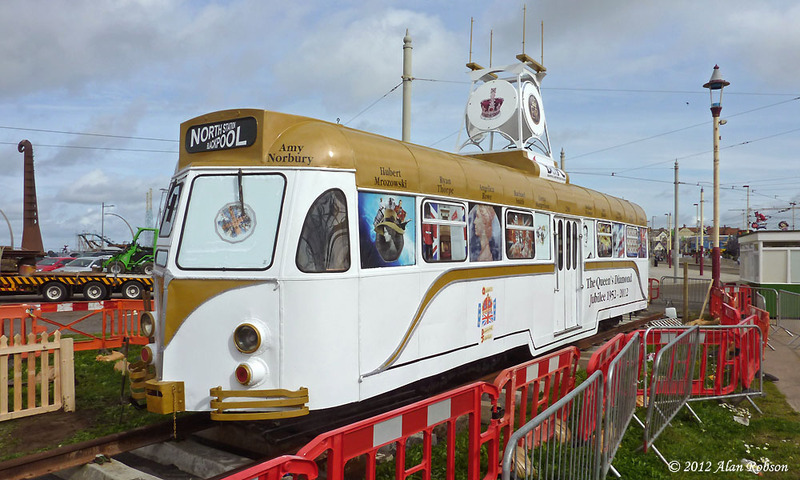 Brush car 627 is now on view to the public on its special display track in the centre of the Pleasure Beach loop. 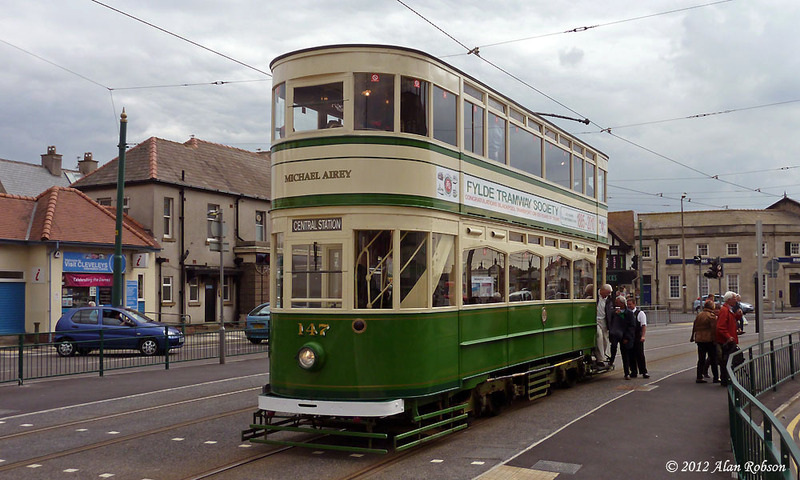 The tower has now been refitted to the roof, and a small wooden picket fence is being erected around the tram. 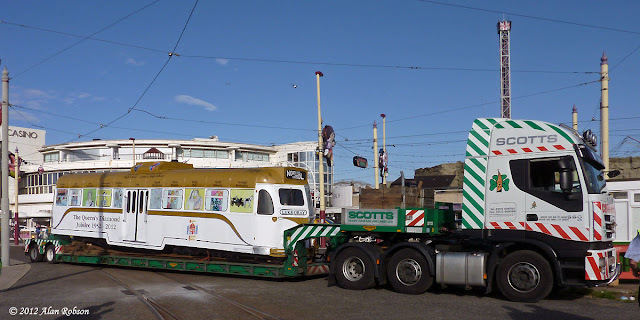 Unfortunately one of the towing bracket boxes is missing from one end of the tram, this was removed due to having use a large shackle to pull the tram out of Kirkham Prison. 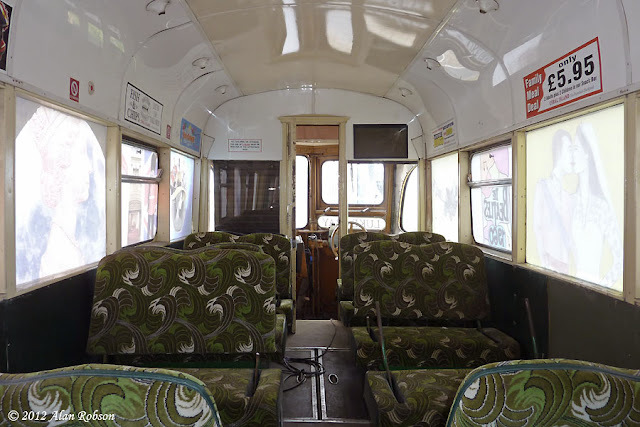 The interior of 627 still has about half of the seat backs missing, most of them in the north saloon. Blackpool Illuminations Department were working on the Rocket at Gynn Square this morning, they have been fitting the new removable lower side panels and also testing the lighting for the first time since the tram was installed on the roundabout. 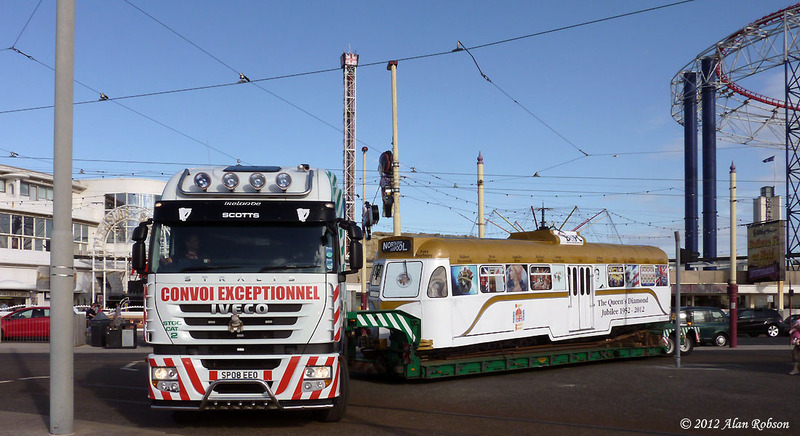 Brush car 627 was transported by Scotts Heavy Haulage from Kirkham Prison today, arriving at its new display location opposite Blackpool Pleasure Beach just after 17:45 this afternoon. 627 has spent the last few months undergoing work inside Kirkham Prison, and has been repainted in a gold and white colour scheme in commemoration of the Queen's Diamond Jubilee celebrations. 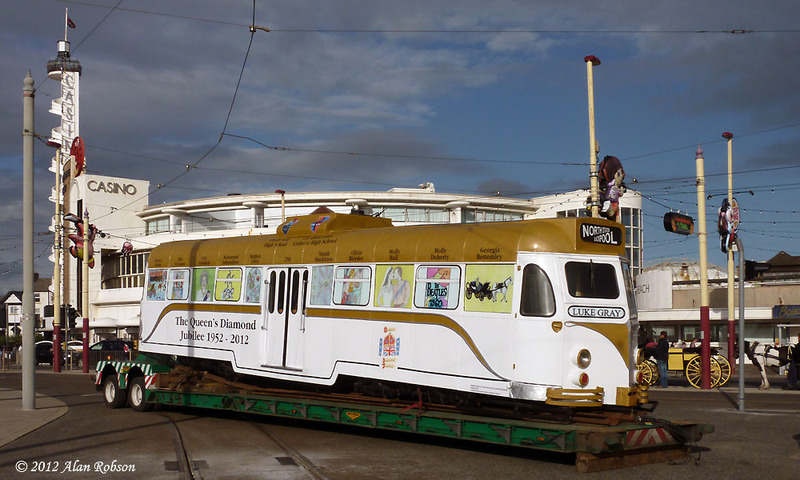 The side windows of the tram display paintings produced by Fleetwood schoolchildren, with the name of the artist above each window. 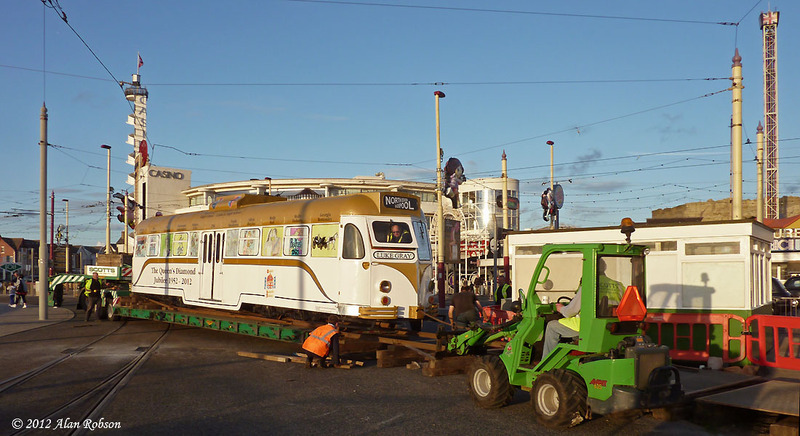 It was to be several hours before 627 was finally unloaded, long after dark had fallen, at around 22:00. 8.35pm, the sun has set, but 627 still hasn't left the trailer yet! Blackpool Dennis Trident 340 (ex Blue Triangle TL919) was noted being towed back to the depot behind ERF recovery vehicle 929, after breaking down on route 14 this morning. 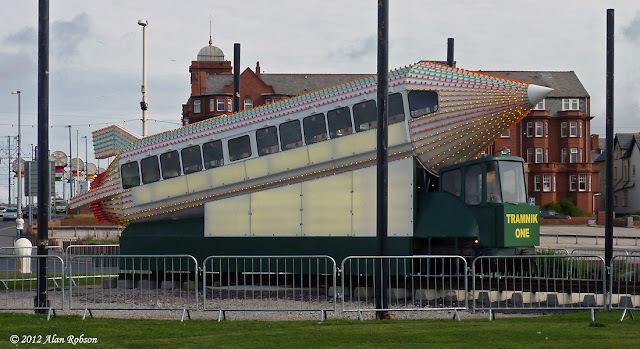 The Rocket has been moved further across the roundabout at Gynn Square, so that it now sits roughly in the centre. 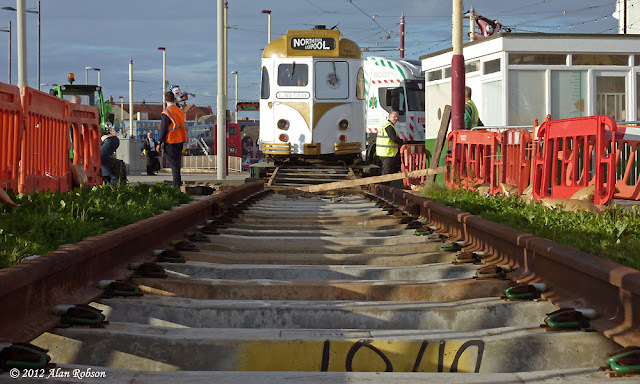 An extra length of sleeper track was fishplated to the existing rails last week, and the Rocket has now been moved from the position where it was originally unloaded, to a more central position on the roundabout. 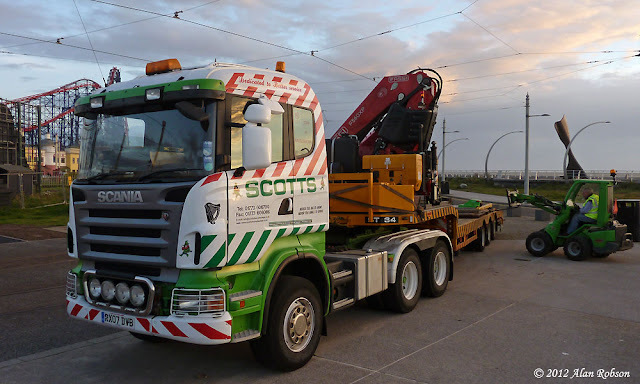 The Rocket tram was installed on a short length of temporary rail in the centre of Gynn Square roundabout in the early hours of this morning by Scotts Heavy Haulage. 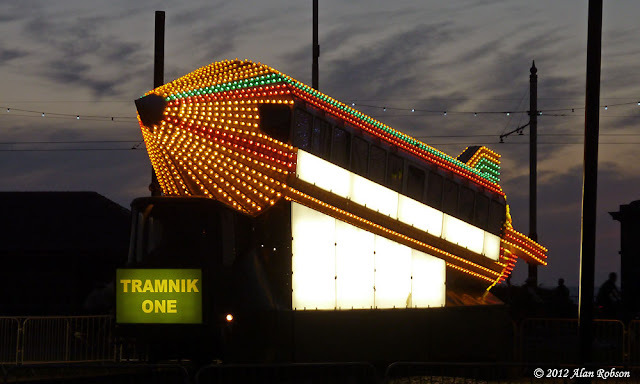 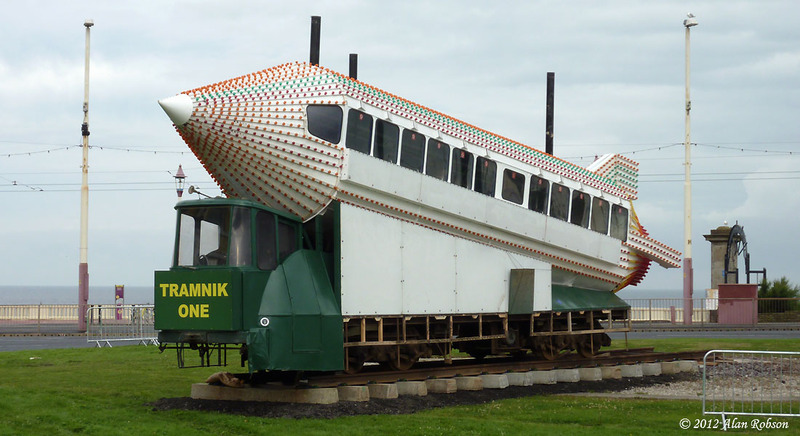 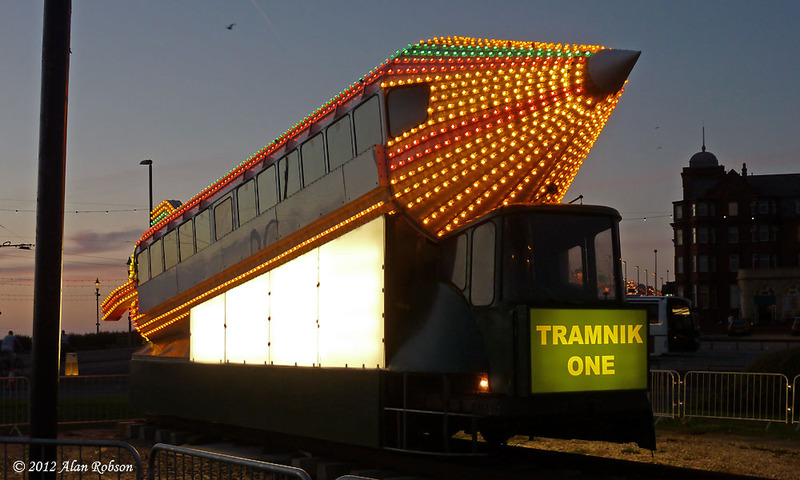 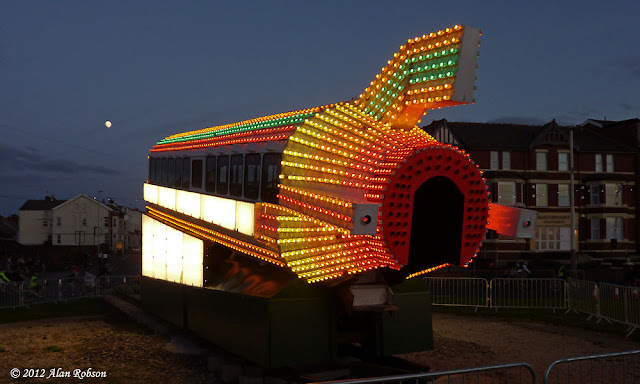 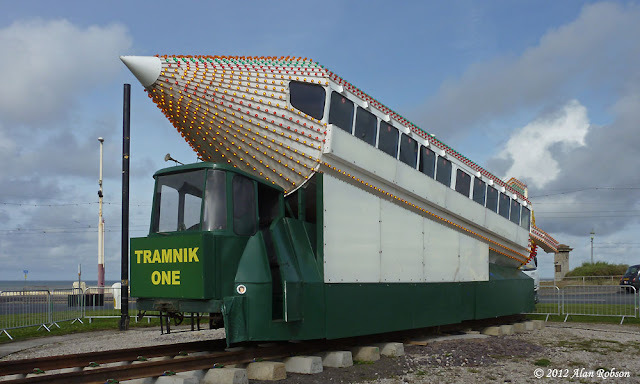 Blackpool Illuminations Department have spent the last few weeks refurbishing the tram for static display during this years illuminations. 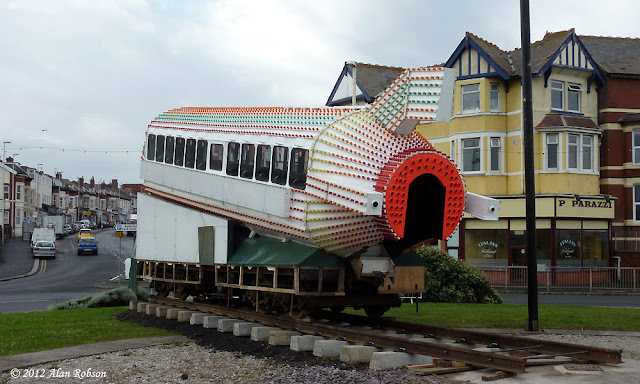 The Rocket had to be positioned facing nose first up Dickson Road away from the Promenade, as this was the only way that it could be unloaded from Scotts low-loader. The tram is still awaiting the fitment of its new removable skirting panels, which were left off in order to facilitate the loading and unloading process, and also to allow the bogies to be secured to the trailer with chains. 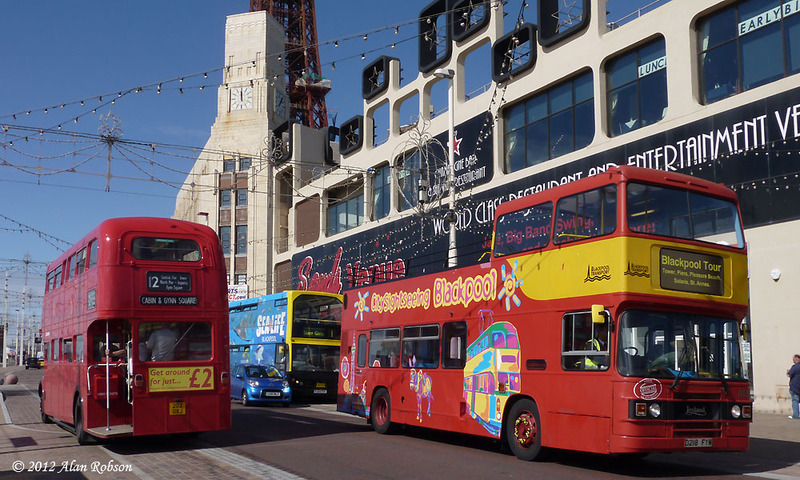 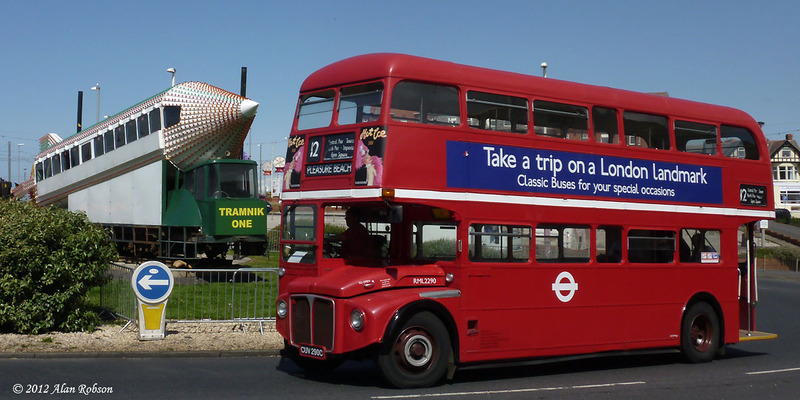 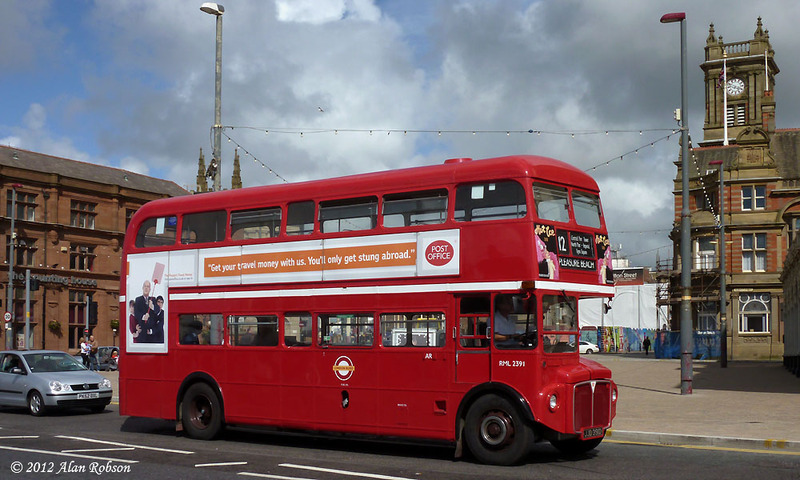 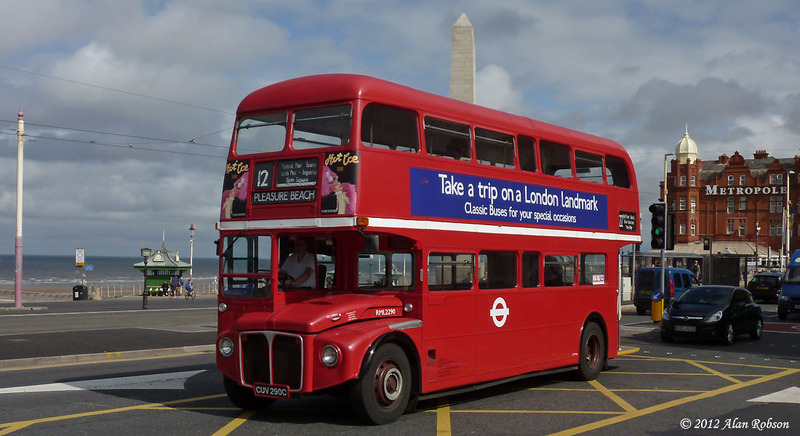 Now that BTS have begun to run the seasonal open-top Blackpool Tour service, there are two competing operators running red buses along the promenade, the ex London Routemasters of the Seafront 12 operation and the open-top City Sightseeing service. The red Routemasters are now beginning to appear with small front adverts either side of the destination box for the Hot Ice show at the Pleasure Beach.